Some companies pay (allot) attention to corporate branding. The cool thing is that Microsoft AD Federation Services (AD FS) supports this. A lot of customization can be found here on this link. But some customization is hard to come by; like I experienced myself. Adjusting the signin page description and fitting in a background is fairly easy to do. But when it comes to lettertype, favico and placeholder(s); it can be challenging. By following this guide, I assume that you have completed the 'create custom web theme'. If not; first create a custom web theme by following this Microsoft article. NOTE: Microsoft recommends that the dimensions for the logo are 260x35 @ 96 dpi with a file size of no greater than 10 KB. For the illustration Microsoft recommends for the illustration to be 1420x1080 pixels @ 96 DPI with a file size of no greater than 200 KB. Open the script file your custom web theme from "C:\temp\adfs\customwebtheme\script\onload.js" on one of your AD FS servers in Notepad(++). Go to the end of the file and paste the following code. You can adjust 'Your login message here' accordingly. // Code to change “Sign in with organizational account” string. // Code to change “Username” string in the placeholder. Open the script file your custom web theme from "C:\temp\adfs\customwebtheme\css\style.css" on one of your AD FS servers in Notepad. The font you want to use, must be place at the begin of the font-family line in order to be used, like I did with Century Gothic. More info here. Just paste the PowerShell cmd-let on one of your ADFS servers. Set-AdfsGlobalWebContent -SignInPageDescriptionText "<p><b>DIT SYSTEEM IS ALLEEN VOOR GEAUTORISEERDE GEBRUIKERS!</b><br><br>Toegang tot dit systeem is niet toegestaan, tenzij geautoriseerd door een daartoe bevoegde persoon van de <company>. 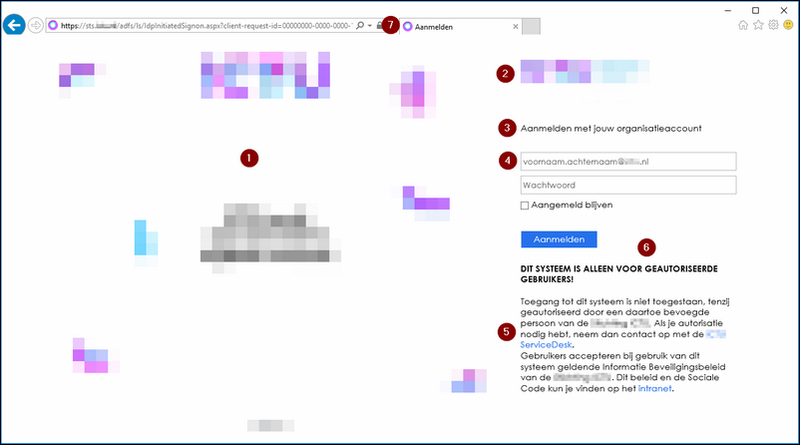 Als je autorisatie nodig hebt, neem dan contact op met de <A href='https://www.domain.tld/help'>company servicedesk</A>.<br>Gebruikers accepteren bij gebruik van dit systeem geldende Informatie Beveiligingsbeleid van de <company>. Dit beleid en de Sociale Code kun je vinden op het <A href='http://intranet.domain.tld/'>intranet</A>.</p>"
Open the script file your custom web theme from "C:\temp\adfs\customwebtheme\script\onload.js" on one of your AD FS servers in Notepad. // Code to add custom favicon. This function uses the favicon.ico from somewhere else; just make sure that the favicon.ico is available by adjusting the link.href accordingly and save the file. Your favicon.ico should be present now. Microsoft link with more information. Locate the Style.css file that is located in the output folder. By using the previous example, the path would be C:\CustomWebTheme\Css\Style.css and open it. That's all for now, thank you for reading and till next time!